I don’t believe it is possible to overrate the power of adrenaline and anticipation. Despite still being plagued by the shadow of jet lag (and maybe the residual effects of having just a little too much fun the night before), we were all up bright and early ready to get our Fall buying trip to a start. 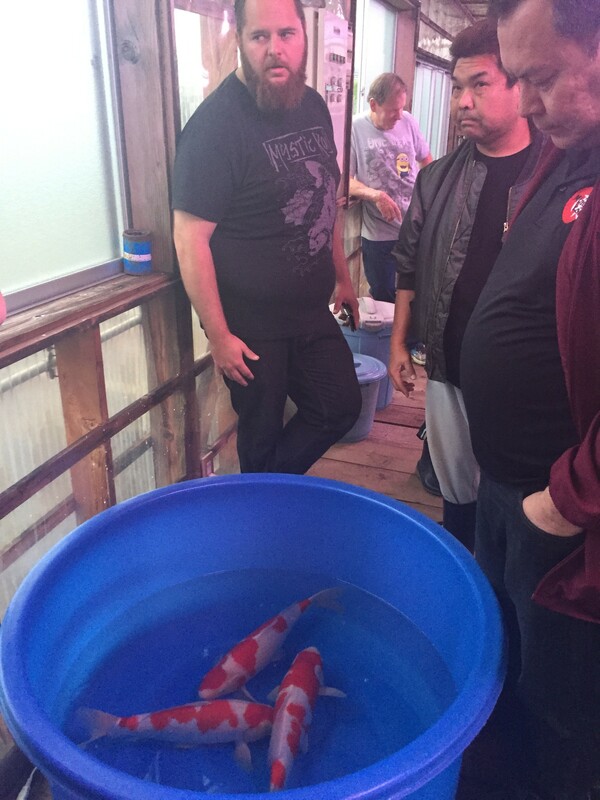 Naturally, our first stop had to be Marudo Koi Farm: Devin’s home away from home. On the harvest schedule for the day was their largest pond, which Devin refers to as the “mini-ocean”; ironically, it is situated quite near to the ocean. It takes them several days to harvest this particular pond and since it is off the beaten path, there usually aren’t any guests who watch this particular pond harvested. We proceed directly to the main house and were greeted at the door by okasan (Marudo’s wife named Yoshie) and we were promptly invited in for coffee. She called Sacho (Hisashi Hirasawa, founder and big boss of Marudo Farm) and let us know that they would be arriving to entertain us shortly. 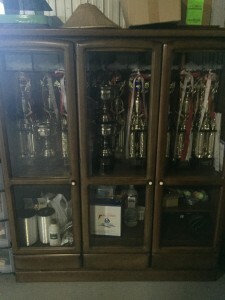 In the meantime, we talked a little bit about how everyone in the family was doing. After we finished our refreshments, we head into the greenhouse and check out the Koi already harvested. In there, we saw a massive Kabuto Ogon that had a mouth that was bigger than a human mouth! The sheer size of it was so impressive that we were all gathered around that tank for a good few minutes to admire it. Marudo had yet to harvest their best nisai gosanke pond, but we looked around to see if there was any non-gosanke that caught our eye. 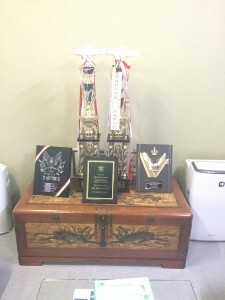 The Murata name is quite reputable in Japan, and that is evidenced by the numerous display areas for the myriad of awards that he has won in several Koi shows in Japan. We were so very warmly greeted by Sacho, his wife and daughter Seimi who showed us some of their Koi. A couple of nice looking Kujaku caught our eye and luckily for us, one was still available for us to buy! I thought it is a great start to our buying trip and we couldn’t pass it up. 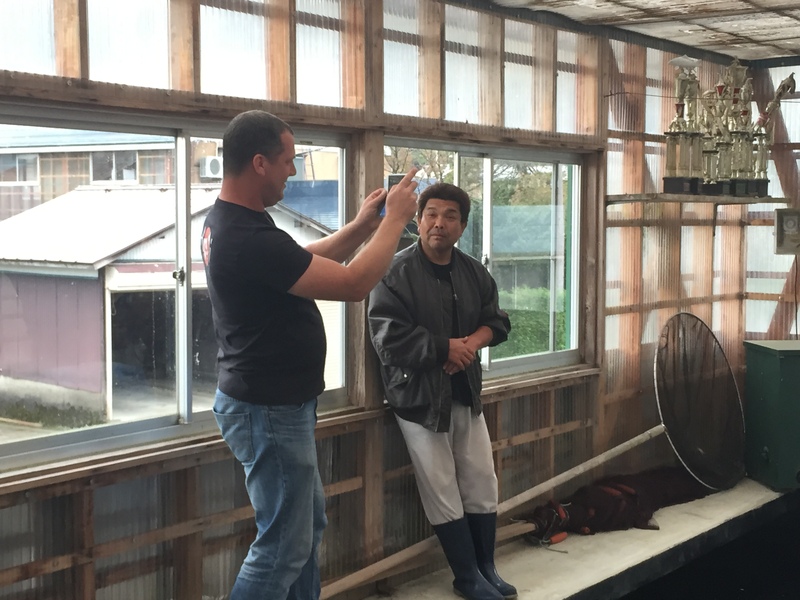 W e finalized the transaction for the Kujaku and Murata invited us to view more of his Koi. 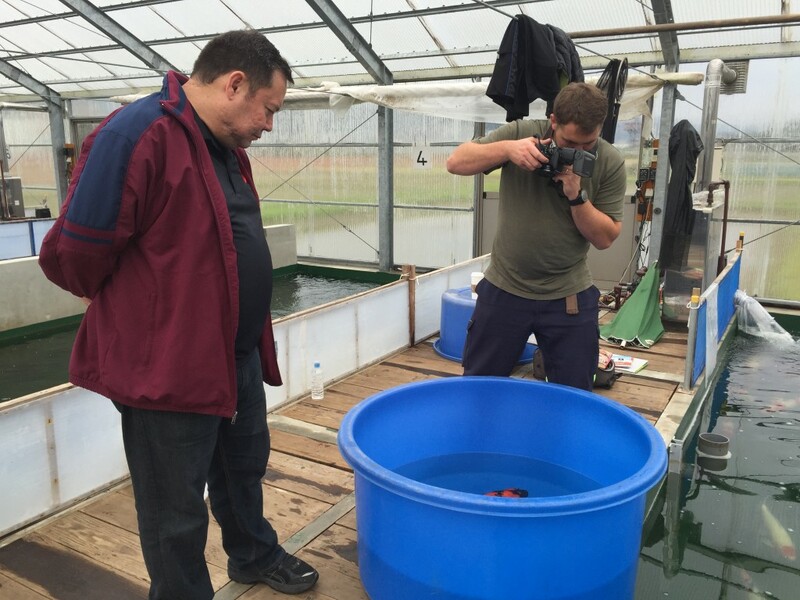 He showed us some of his nisai Kohaku in another greenhouse and swimming in the same pond was a very large, full-bodied and beautiful Kohaku. The awesome thing about visiting all the farms in Japan is being able to see both facilities and oyagoi, which I truly enjoy. I find it so fascinating and while it may or may not really reflect what we can or should expect from their offspring, the minuscule peek into a possible future brings a little insight into it’s potential. 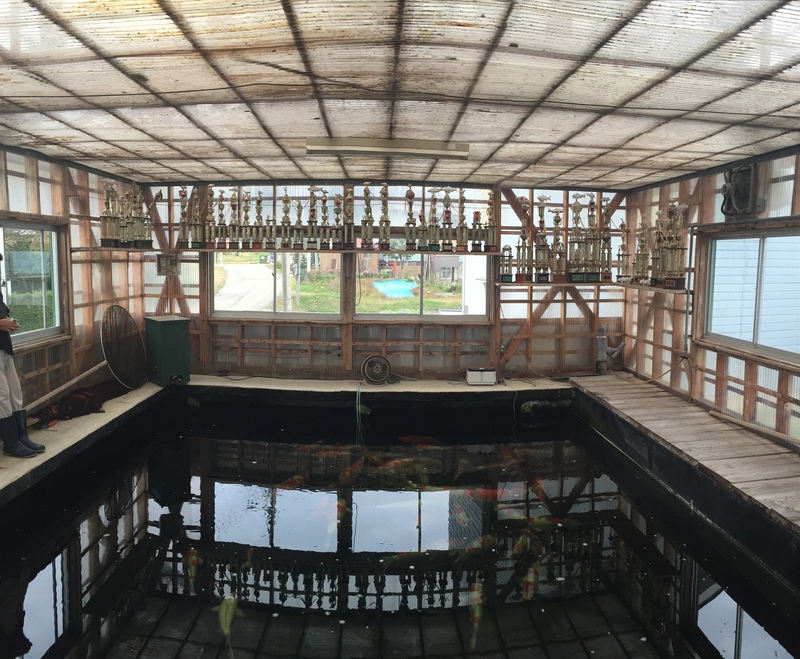 Being a girl visiting all these remote Koi farms in Japan can be quite challenging, especially when you feel the need to empty your bladder. To all the ladies who have not been to Japan but are planning to in the near future, word of advice: whenever you get the chance to use the restroom, TAKE IT. Most of the time when you are visiting greenhouses, there is a real scarcity of proper toilets in most Koi facilities. Unfortunately for me, I had forgotten to mention it to Devin before going to see Murata Koi Farm. I asked Murata-san’s daughter if there was a restroom that I could use, and she said we had to get into the car to go to see it. We ended up having to go the nearest convenience store to use their restroom, which was about a 10 minute drive from the greenhouse. While it was quite a distance from where we were, but I quite enjoyed the ride because I got to know Seimi-san a little bit more. She is only a few years younger than me, so we were able to connect quite easily. By the time we returned to the greenhouse, all the men were just waiting for us to return so that we could all get back in the car to drive over to another greenhouse. When we get there, we find some very nice nisai Koi that Shawn decided to pick up a few fish for his shop. Most of you might have already seen these Koi on Facebook since there is a video posted on Facebook of these Koi. Darkness arrives earlier in the Fall, so by 5:30 the entire place is just pitch black. We are invited into the Murata Koi Farm office to enjoy some refreshments before heading back to Nagaoka for dinner. 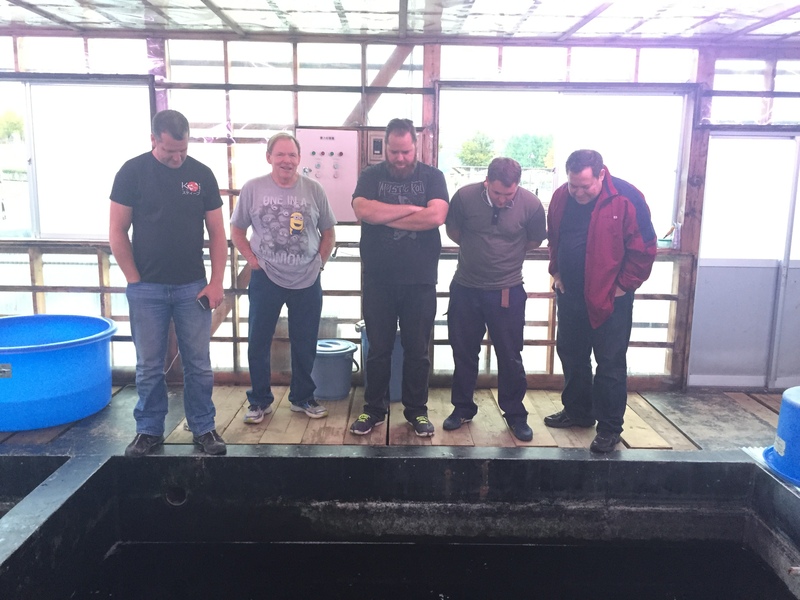 While there, we invited to return back at a future date to view the Koi that is to be harvested from their best nisai mud pond. We graciously accept and make a note on our calendars to come back then. I am quite looking forward to seeing the harvest from this pond, especially seeing what they have to offer so far!